It was late when we went to sleep after the late night concert…sometime after 1:00 am. We set the alarm for 8:00 but sleep a little later. We didn’t have breakfast until 9:30. We took our TomTom GPS out to the plaza for a test. It was slow but it worked. We then starting walking towards Church Church of the Eremitani (the Hermit church) and Scrovengni Chapel (the Arena Chapel) and on another ten minutes to the train station. We had asked the desk clerk at the hotel to call Avis about our rental car. They had said we couldn’t get it until 10:00 am but we had reserved it for 8:30 am. We had a hard time communicating between the desk clerk and person at Avis, so we decided walked to the train station to talk to Avis. The office was not at the train station as advertised but about ten blocks further. So we had a good hike. We saw a lot of the more contemporary sections of Padua. The train station itself was very interesting. The lady at Avis finally said that we could have our car at 8:30. We walked back towards our hotel and found a nice sidewalk café opposite the Hermit church. We sat next to an older couple (about our age) from London. We had an interesting conversation. He had written one book and was working on a second one about art in his church compared to the great art in Italian and other churches. They invited us to visit them if we came to London again. After lunch we walked to the University of Padua for a tour that we had booked yesterday. The University was founded in 1222. 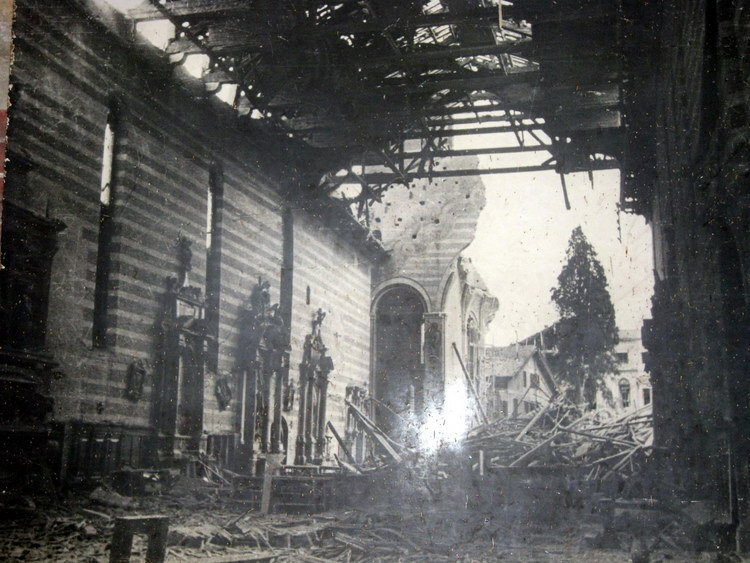 It is now a large complex of ancient and modern buildings. Our guide gave the tour speaking first in English and then in Italian. The upper loggia leads to the Hall of the Faculty of Medicine. On the walls are portraits of famous doctors. From there we went into the Anatomical Theatre, which was built in 1594 and is the first permanent anatomical theater to be built in the world. It is like a cone turned inside-out and is divided into six wooden ellipses of decreasing dimensions. She showed us the famous operating theater from the bottom but not the top. No pictures were allowed. The second stop was a large classroom – The Room of Forty where there are portraits of famous students and Galileo’s chair. Galileo was chair of the department of mathematics from 1592 to 1610. Our tour ended in a beautiful lecture hall with a lot of frescos. From there we walked over to the Ragione Palazzo Salon/law court. It is the building where the markets are on each side. 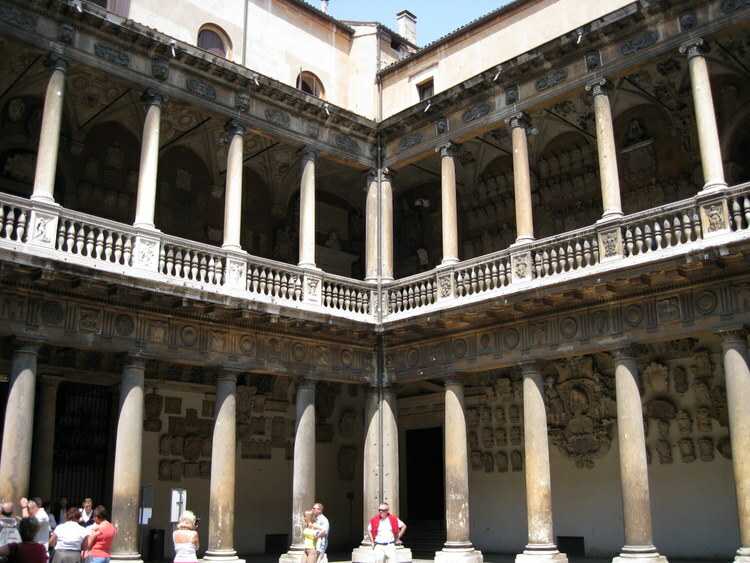 This structure, built from 1218 to 1219, was the Palace of the Comune in the age of the first Lombardic League. 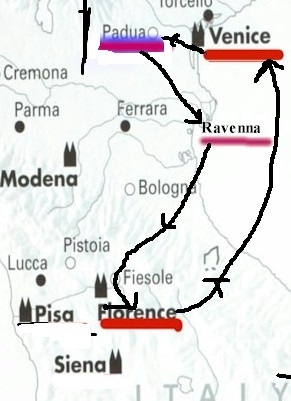 It was expanded in the early 1300’s. In 1420 it was damaged by fire and again restored. 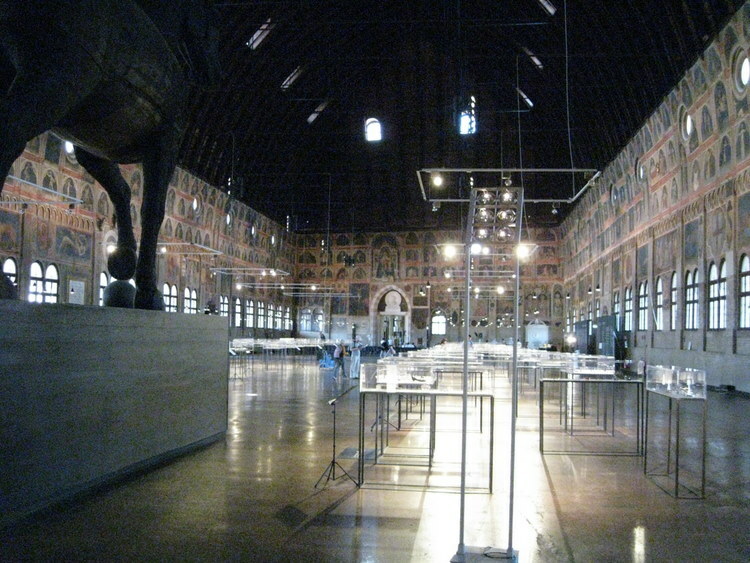 A single hall was made of the two upper rooms. It measures 258 ft by 88 ft. 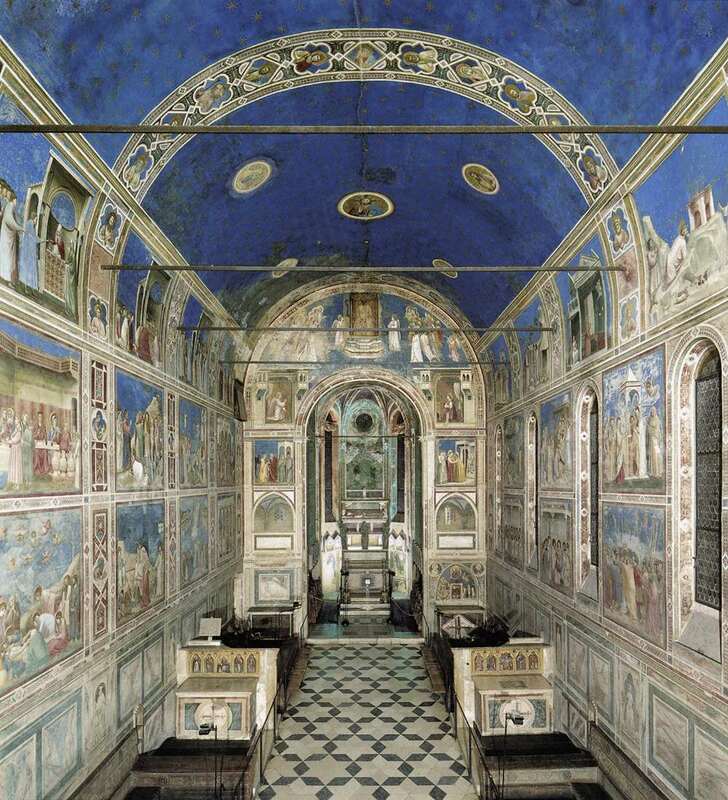 It was a huge room with the walls covered with Fresco, some by Giotto. 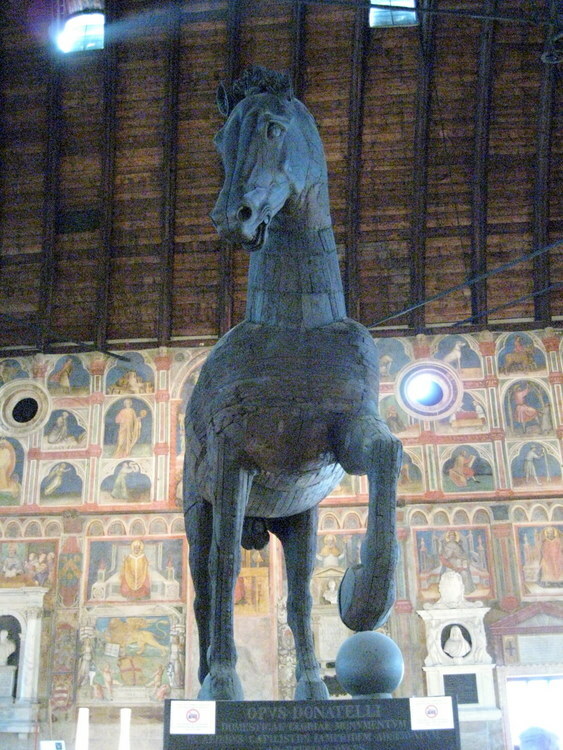 At one end was a very large wooden horse. This horse was transferred here in 1837 from the Emo Capodilista Palace. It has been falsely attributed to Donatello. There was a display of gems and jewelry. It was a fascinating building. 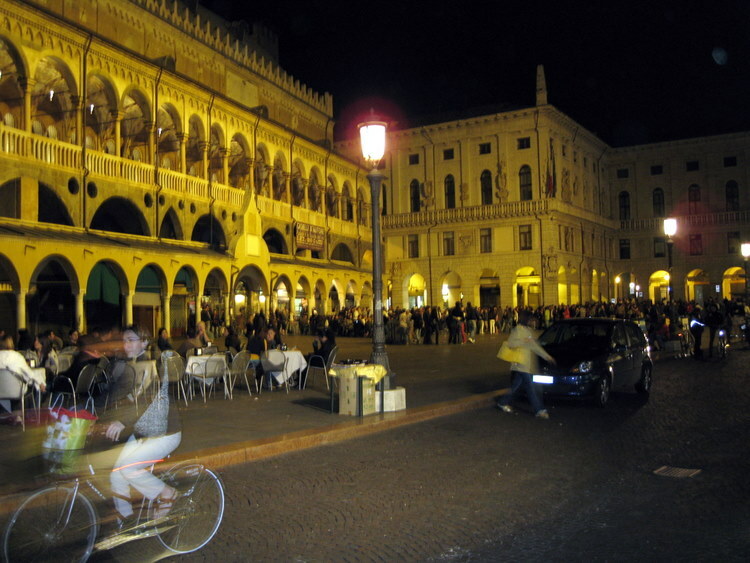 After spending a lot of time in the Ragione Palazzo, we stopped in a nice outside café for drinks and snacks. While we were there, my wife checked her phone and found she had a voice message from Verizon about my cell phone. A TRAVEL HINT- I would advise everyone who travels abroad to have a cell phone. Each person should have one in the event that they get separated. In our case we also needed a phone to link up to our friends when we arrived in Florence. Most phone companies, ours is Verizon, have a special phone that they will send to your free or at a minimal fee which has Europeans access at a reasonable cost. At the end of the trip it is mailed back to the company. 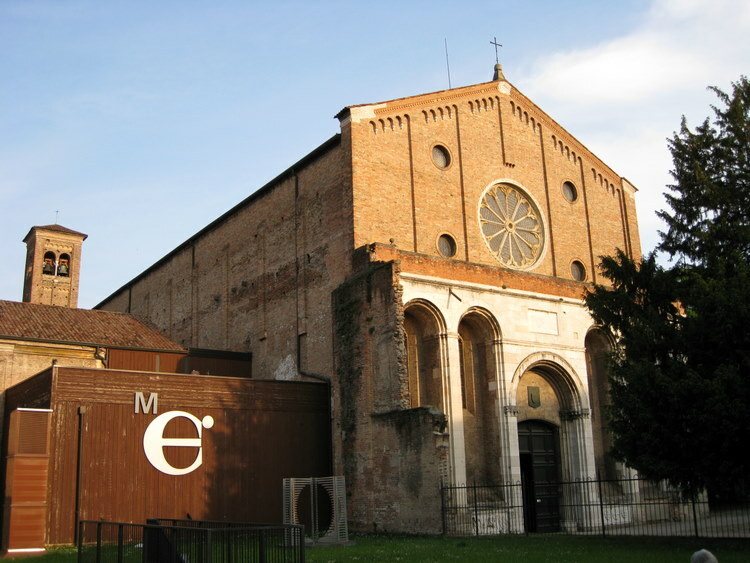 When we arrived in Padua, my phone would not work, and we were unable to contact Verizon, so we called my wife called her sister in Texas and asked her to contact Verizon and have them call my wife’s cell phone to tell us how to correct the problem with my phone. The voice message told how to contact Verizon. We called them back, and they were able to correct the problem with the satellite connection. It was amazing how they did that. They were in the states and we were in Europe!! Then we went back to the Church of the Eremitani which is also called Hermit church. It didn’t open in the afternoon until 4:30. This church dates back to 1276. It had been built for the Order of the Eremitani Brotherhood. The architecture is 13th century mid-Veneto. The upper part of the facade is in fired brick. Underneath the sloping roof are small hanging arches. In the center of four and a half pilaster strips is a rose window with two smaller round windows (eyes) on either side in the center to adjacent pilasters. The lower part is in stone, and lowest part has no decorations – only pilaster strips and high windows. 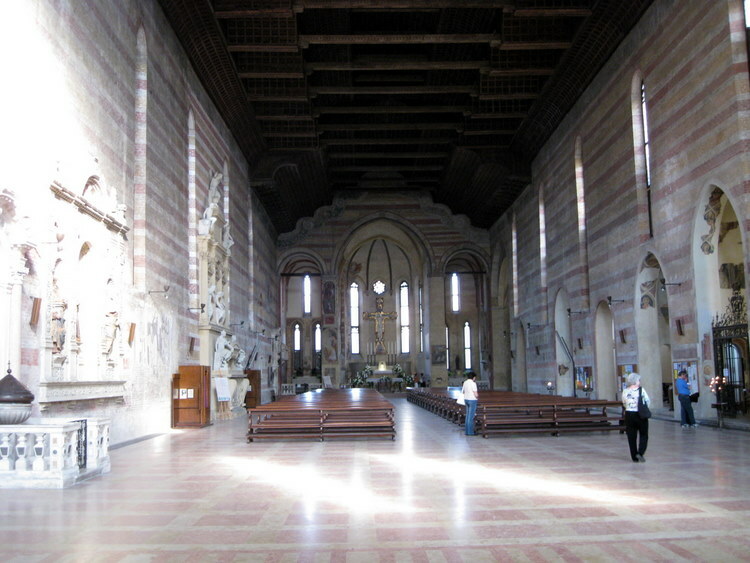 Inside, the main nave ends in a central apse and two small apses on either side. It has a wooden boxed-in ceiling.
. In one chapel, the drawing on the wall of the previously damaged fresco could be seen. They were just beginning to apply paint to various small areas. We visited a small chapel and participated in the Mass that was being sParts of some of fresco were still on the walls and others aid. Next door was the Scrovegni Chapel, commonly called the Arena Chapel because it is in the garden of a former Roman Arena. 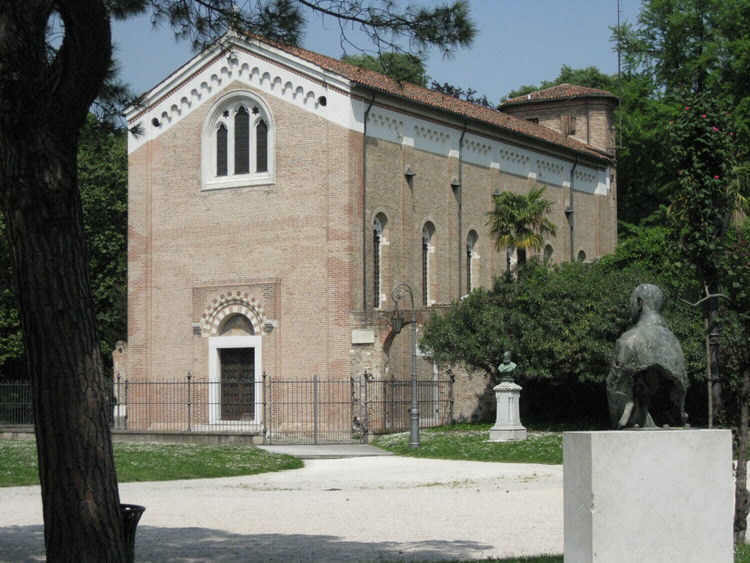 The chapel is famous because Giotto was commissioned by Henry Scrovegni to fresco it with the story of Mary and Christ. It is the best conserved fresco work of Giotto. Only 25 people are allowed in at a time for a 15 minute visit. We had reserved tickets some months before on the internet. Several people that I talked to in my classes could not even get a ticket which was very disappointing. SO ORDER ON LINE BEFORE GOING!!! Before entering the Arena Chapel, purses, back packs, etc had to be checked at the museum store. Then we had to go into a sort of a temperature stabilization room before going into the chapel. 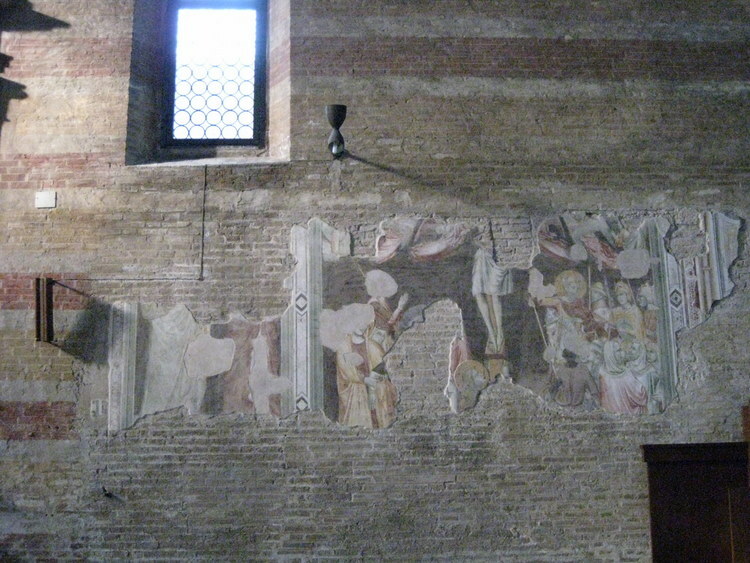 While this was taking place, a video about the frescos was shown. 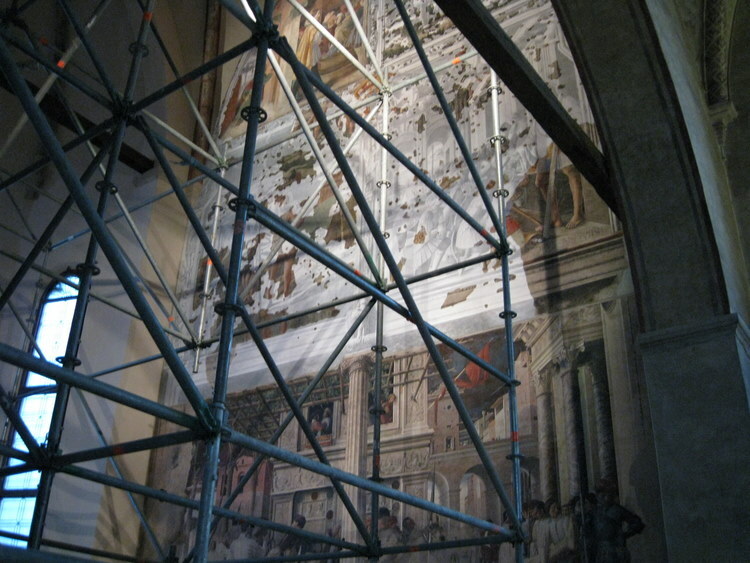 This cycle is even larger, more complete, and better preserved than the famed St. Francis frescoes in Assisi. Giotto worked from 1303 to 1306 to completely cover the ceiling and walls with 38 scenes illustrating the lives of the Virgin and of Christ from floor to ceiling. There are three bands that cover the walls are: top right, Life of Joachim; top left, Life of the Virgin; right center, The Childhood of Christ; left center, Christ's Public Life; right bottom, The Passion of Christ (the third panel of Judas kissing Christ is the best known of the entire cycle); left bottom, Christ's Death and Resurrection. Above the entrance is the fresco of the Last Judgment: Christ, as judge, sits in the center, surrounded by the angels and apostles. Below him, to the right, are the blessed, while to the left, Giotto created a terrible hell in which devils and humans are condemned to eternal punishment. Cobalt blue is the dominant color; the illustrations are in that typical easy-to-understand medieval comic-strip format, but here they take on an unprecedented degree of realism and emotion. Of course no pictures were allowed. There are a number of good websites where you can view all of the fresco. Afterwards we went back into the museum to get my wife’s purse and bought a book about Giotto and one about Arena chapel. It was truly a wonderful experience. We went back to the hotel and packed a little before going to bed.